Scroll down, click on "Mammals" in the left menu and click on an animal. A pocket-sized guide with 1000s of incredible facts about the living world. Clear, concise text and detailed illustrations reveal the fascinating lives of animals and plants in a simple, attractive way. 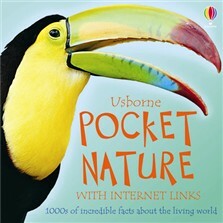 Full of facts about wild animals, birds, fish, creepy crawlies, butterflies, trees and flowers. Includes internet links to carefully selected recommended websites via the Usborne Quicklinks website. This book contains the following Usborne Pocket Nature titles: Fish, Flowers, Birds, Wild Animals and Butterflies and moths.